Momeson Cream: Each gram cream contains Mometasone Furoate BP 1 mg.
Momeson cream is indicated for the relief of inflammatory and pruritic manifestations of corticosteroid- responsive dermatoses, such as psoriasis and atopic dermatitis. A thin film of Mometasone Furoate cream should be applied to the affected skin areas once daily. Safety and effectiveness in paediatric patients below 2 years of age have not been established. 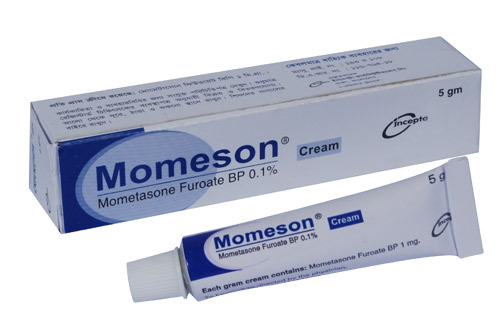 Mometasone Furoate cream is generally well tolerated. Burning, Pruritus and skin atrophy may occur. If irritation develops with the use of Mometasone Furoate cream, treatment should be discontinued. Pregnancy: There is no adequate and well-controlled studies in pregnant women. Lactation:It is not known whether this drug passes into breast milk.